Kirill Formanchuk (born 25.08.1983) is an activist for motorists' rights in Yekaterinburg, Russia. On October 12, 2007, he suffered severe injuries from a beating while in police custody, which has led to increased public and media scrutiny of traffic police in a number of Russian cities. Formanchuk nowadays also acts as a senator in civil Ekaterinburg Senate aimed at providing public control for official authorities. He focuses on automobile-related affairs. 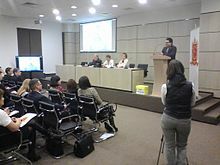 Wikimedia Commons has media related to Kirill Formanchuk. Levy, Clifford J. "Weary of Highway Bribery, Russians Take On the Police", The New York Times, October 28, 2007. Accessed October 28, 2007.